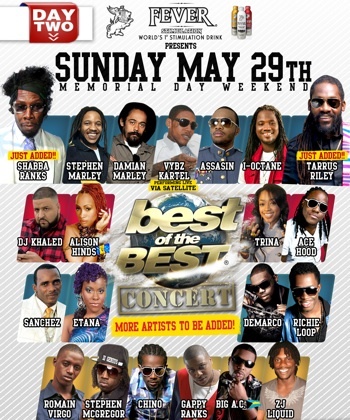 The legendary Shabba Ranks has officially been added to the long list of artists who will converge on the City of Miami May 26th-30th for Best Of The Best Weekend 2011. Ranks joins an already stellar list of performers scheduled for the back-to-back blockbuster concerts jumping off on Saturday, May 28th and Sunday, May 29th at Bicentennial Park (1075 Biscayne Blvd). The Jamaican music icon will perform on day two, alongside some of the top acts in Reggae, Hip-Hop, Dancehall and Soca, such as Stephen and Damian "Jr. Gong" Marley, DJ Khaled, Vybz Kartel (who will appear with his band live via satellite from Jamaica), Tarrus Riley, Alison Hinds, Trina, Assassin, Etana, Sanchez, I-Octane, Ace Hood, Stephen McGregor, Chino, Richie Loop, Demarco, Gappy Ranks, Romain Virgo, Big AC and ZJ Liquid. Day one, dubbed Spring Fest, will feature the best of the best in contemporary R&B, including Chris Brown, Keri Hilson, Lloyd, Jeremih, Miguel and Marsha Ambrosius (formerly of the duo Floetry) and Travis Porter. Nationally syndicated radio host and comedian Rickey Smiley will host with Jabba of Massive B.